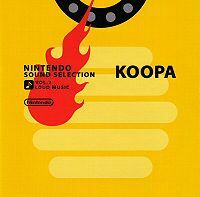 Nintendo Sound Selection Vol.2: Loud Music is a compilation album exclusive to Club Nintendo members. Like the Healing Music CD, the Loud Music CD could only be obtained by redeeming 400 points. The focus of this CD is on louder and heavier music. 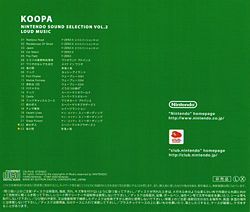 Tracks from eight different Mario games are featured on this CD, including one each from Wario Land 4, WarioWare, Inc.: Mega Microgame$!, Super Mario World 2: Yoshi's Island, Super Mario World, Super Mario Kart, Mario Kart: Super Circuit, and Luigi's Mansion. The "Fortress Boss" music from Super Mario Bros. 3 appears once in its original form, then again in track 22 as an extended "arranged" version by Nintendo sound staff. NOTE: Tracks 22 and 23 are performances by Nintendo music staff. Back cover including the track listing. The front cover and the CD. The Koopa Castle Course BGM for Mario Kart: Super Circuit on the CD is actually the uncompressed version of the original heard in the game. This page was last edited on September 9, 2018, at 21:02.